MEDIAGIRLS reveal their 14 top media sheroes in honor of Galentine’s Day! “Ladies celebrating ladies.” That’s how lead character Leslie Knope (played by Amy Poehler) on “Parks and Rec” explained Galentines Day, declaring it “only the best day of the year.” The day may have been fictional when Leslie first said it in 2010. Today, it’s a very real holiday for many of us, celebrated each February 13th. This year we celebrated by inviting our Youth Advisory Board to meet up in person, and create Galentines for our favorite inspirational girls and women who use media to speak up. We loved our girls’ diverse picks, from Oprah Winfrey and Reese Witherspoon to Judge Marie Aquilina and Greta Gerwig, and you can check them out below. Note the hashtag “#realmediagirl” on each heart, which is our term for a girl who uses her social media to speak up for girls and women, and lift each other up. TRY THIS: Ask your girl who she considers a #realmediagirl, and why. It could be a celebrity, a friend, sister, or mentor. Ask her to show you a few examples of media content put out by this everyday shero. Even better, encourage her to reach out and tell that girl or woman, in person and/or on social media, how appreciated she is. 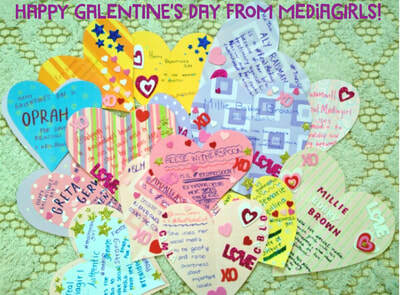 It’s always a good day to tell our role models we admire them, but Galentine’s Day makes it exceptionally easy. Click here for more #MediaMondayTips to help you spark conversation with your pre-teen and teen girls?